We were greeted at the port by the President and CEO of Oceania Cruise lines, Bob Binder, who is from Allentown, PA! He had one of the crew take our picture with him and we chatted for quite a while. If they forward the picture, I will share. He informed us that there are 160 passengers traveling for the whole 6 months. The rest of the ship will be filled with passengers doing some of the segments of our trip. 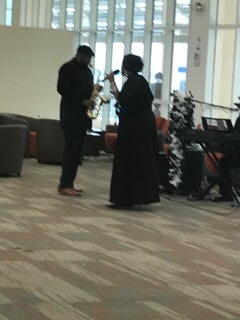 There were mimosas waiting as we checked in and a small group playing music that made us want to dance! We have met several crew members that we know from last year, happily my hairdresser from last cruise is here. And we know Victor who is the general manager, we also know the captain, Maroje Brajcic, and the cruise director, Leslie Jon. 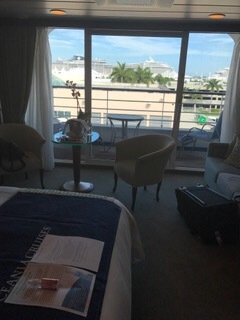 We will see who else we know in the upcoming days – several passengers are already friends from our last cruise and others recognize us from my blog which I posted to the Cruise Critic forum for this trip. 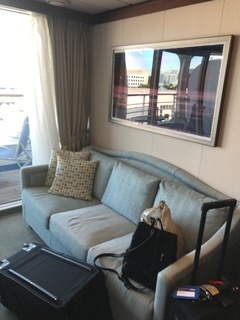 Our room was ready as the ship had been in dry dock in the Bahamas for 2 days before our arrival. 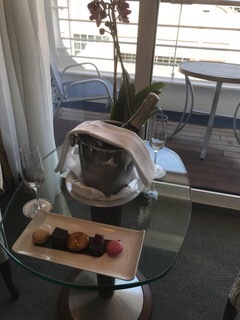 We had lots of delightful surprises as we entered our room – orchids, champagne, wine, Baileys and some lovely desserts. We are all unpacked, have selected some books from the extensive library and had a lovely lunch. Next will be the mandatory drill and sailaway music. Relaxed already, happy to be back and ready to set sail! 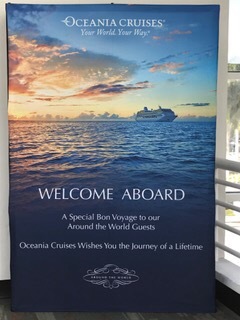 This entry was posted in At Sea, January, North America, World Cruise 2. Bookmark the permalink. How nice that there are so many familiar faces…especially your hairdresser! I’m curious if you have same/similar room as the first trip, or if you are trying a different layout or location for your room this time. (perhaps for future post) Have a great launch! We moved to a penthouse suite this time, it is bigger and we have a butler! Who is your butler? I know a few from our trips. Looking forward to your 6 months. I feel like am on vacation when reading your post. Vietnam, Cambodia and Laos was amazing and Disney does great family centered land tours. Thanks for asking. Yes, we moved to a penthouse suite. And we have a butler! Been looking forward to your trip (so we can travel by computer). Happy New Year and enjoy your adventure. Bon Voyage, Pat and Norm! Thanks for taking us along vicariously! Your last blog had your itinerary listed making it easy to see where you were going and were you had been. Will you be posting your full itinerary for this trip? Yes, it is on the same blog but on the top navigation bar, look for “itinerary 2”. All of the dates and ports are there!. Hope your trip was wonderful.